As we are nearing the conclusion of our job and our contracts with industry sponsors, the Commonwealth Government and Core Participants of CRC LEME, this Minerals Brief refers to our technology transfer activities where final outputs are being disseminated via LEME publications, presentations, the media and this web site. CRCs Success Through innovation - Summer 2008. CRC Program Newsletter features LEME Research - Deep Sense Reveals Minerals - page 3. Links are provided below (November 2007) for full details of the research. Signficiant increase in Exploration Licence Applications in the Western Yilgarn Craton following release of the Laterite Geochemical Atlas and Database for the Western Yilgarn Craton (OFR 116). 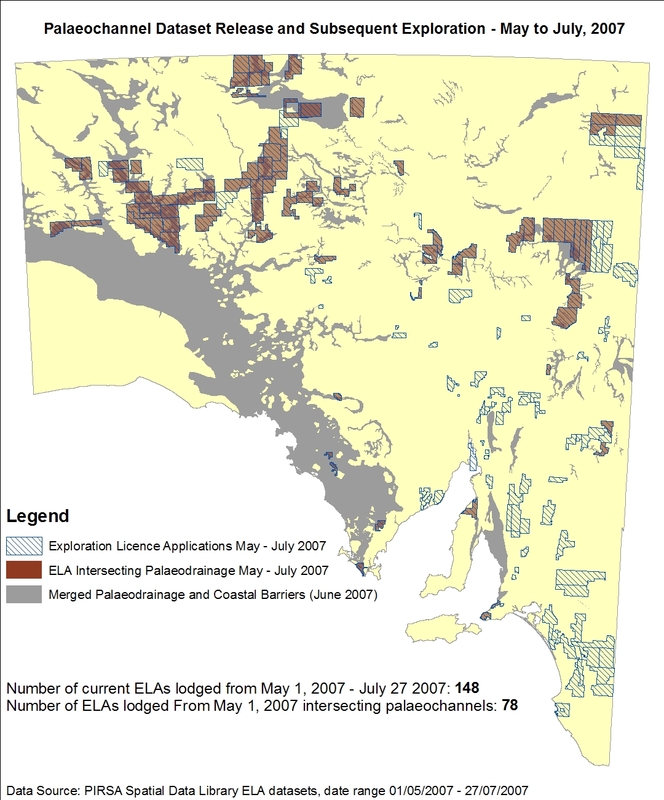 Release of the Palaeodrainage and Tertiary Coastal Barriers Map of South Australia results in 78 Exploration Licence Applications over palaeodrinage systems in South Australia. Twenty five LEME presentations at the Int Applied Geochemistry Symposium, June 07, Spain. 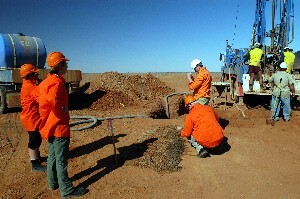 The presentations covered an array of regolith research such as using termitaria as a biochemical sampling medium, nickel sulfide exploration using hydrogeochemisty, and using groundwater chemical, geochemical expression of bedrock mienralisation through deep cover and isotopic compositions to earch for copper-porphyry deposits. Besides tasting great, soft drinks and wine may have the right chemistry to extract metals in soil. CRC LEME Researcher, Dr Ryan Noble, who is based at CSIRO Exploration and Mining, Perth said the chemical ingredients within these beverages have the ability to put weakly-bound metals in solution. “Soft drink and wines contain a lot of weak organic acids such as citric acid – the chemical responsible for the sour taste in lemons, limes and oranges,” Dr Noble said. “When you mix the drink with soil, these acids dissolve some of the metals in the soil, releasing them into solution. 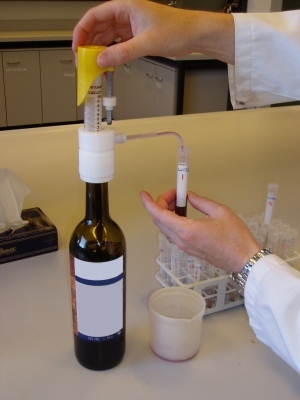 The chemical ability of cool drinks and wine makes them very suitable for use as a cheap extraction tool that can be applied to mineral exploration. “Their ability to mobilise metals at a range of soil pH conditions means that cool drinks and wine could be used to find out if soils contain elevated levels of metals such as silver, zinc, copper and nickel,” Dr Noble said. This presentation by Dr Noble, including statistical tests, outlining the potential use of cool drinks and wine as partial extractions for the mineral exploration industry featured at the 2007 LEME Mineral Exploration Seminar. LEME MINEX SEMINAR 07 ABSTRACT VOLUME AND POWERPOINT PRESENTATIONS ARE AVAILABLE TO DOWNLOAD. Central Gawler, Curnamonda, Lachlan Fold Belt, Thomson Orogon, Tanami, Yilgarn. Baohong Hou, Wen-Long Zang, Adrian Fabris, John Keeling, Liliana Stoian, Martin Fairclough. CRC LEME, Geological Survey PIRSA. An ARC GIS DVD with relevant geographical and geological information, high resolution images and PDFs is available from PIRSA. To give you a taste, here is a PDF showing the index to the Metadata. Full information and purchase of DVD via PIRSA web site. Release of the OFR 116 / GSWA Record 2007/9. 2007. Cornelius M, Robertson IDM, Cornelius AJ and Morris PA. Map [228MB ] Petrography [40.4MB ] SumStats [39Kb ] Digital Data Zip File. Abstract. [52Kb] Appendix 4 - site photographs may be obtained with hard copy from Geological Survey WA. OFR 188. 2005. Laterite geochemical database for the central Yilgarn Craton, Western Australia. OFR 201 - CEM P2006/75. 2006. Laterite geochemical database for the southwest Yilgarn Craton, WA. Report [26MB]....Digital data Excel [1.5MB]....Digital data Text .....Licence. Cornelius M, Morris PA, Cornelius A. The project is aimed at establishing a geochemical atlas for the Western Yilgarn Craton, using lateritic residuum, lag derived from lateritic residuum and lateritic detritus from colluvium. The overall objective of a geochemical atlas is to identify major new geochemical trends and provinces, both in residual and in depositional terrains, that could assist exploration and lead to the discovery of new mineral deposits. The project is in collaboration with the Geological Survey of Western Australia and MERIWA. Approximately 2000 samples from the southwest quadrant of the Yilgarn Craton have been analysed and results have been published as CRC LEME OFR201 in March 2006. In 2006, sampling will continue in the NW quadrant and a number of laterite samples from previous CSIRO and CRC LEME studies, representing different styles of mineralization and different commodities, and different bedrock types, e.g., from Golden Grove, Boddington, Mt Gibson, Lawlers, Ora Banda, Beasley Creek, will also be included for analysis to provide target data sets for statistical evaluation using multivariate analysis. Representative samples from various parts of the western Yilgarn and samples both with an unusual and a typical geochemical composition will undergo mineralogical investigation. Collect approximately 700 samples in the northwestern Yilgarn and analyse using ICP-MS and XRF. P rod uce imaged concentration maps for 53 elements. Correlate geochemistry with major lithological bedrock units and structural features. Identify major new geochemical trends and provinces. Calculate exploration indices, e.g., CHI and PEG (after Smith and Perdrix). Characterize the mineralogy and fabric of representative samples. Release of Regolith 2006: Consolidation and Dispersion of Ideas. Proceedings of the CRC LEME Regolith Symposium, November 2006. Hard Copy Volume available to purchase - 385 pages and 93 extended abstracts. Also individual Abstracts available to download. Program 1 CurnaMinex Project - a collaboration between LEME and colleagues from Canada, China and USA. The team visited Heathgate Resources Beverly Uranium Mine in SA - investigating viable exploration strategies for various conditions and geophysical character of deposit types. Steve Rogers, LEME CEO joined the field trip. 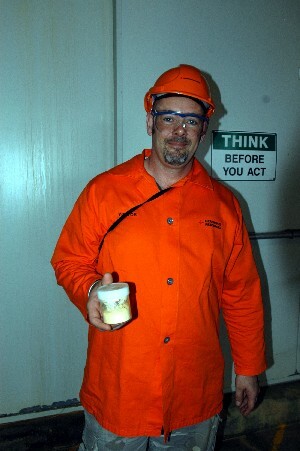 Steve Rogers with Yellowcake from the Beverley processing plant. Looking at drill spoil - Geoff McConachy (Heathgate Resources), and Steve Rogers. Looking on LEME PdD student Karen Hulme and Hons Student Rachael Wilson. This newsletter is circulated electronically. Contact crcleme-hq@csiro.au if you would like to be added to our e-mailing list. LEME Minerals Exploration Seminar - 11 August 2006, Perth. A LEME paper entitled ‘ Mineral explorers use plants and animals to unveil Australia's desert wealth' given by Education and Training Program Leader, Dr Steve Hill, at the 2006 CRC Association Conference in 17-19 May 2006, Brisbane, proved to be a very popular, not only because of its 'innovative' science but because of Steve's engaging presentation style! Karen Hulme (left) and Adrian Fisher painstakingly sample the regolith at one of the sites in the Thomson Orogen. Megan Lech, Karen Hulme and Adrian Fisher went well beyond the black stump to remote north western New South Wales to complete an extensive regional geochemical sampling program. 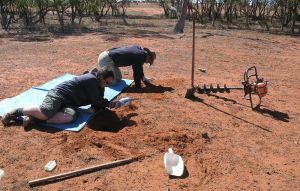 During the sampling, it became apparent that certain regolith-dominated landscape settings correlated with distinct plant communities which included Black Box, Coolibah, Bimble Box and River Red Gum. Hopefully, the results will show that the species are not significantly different chemically and can be interpreted using a community approach. “We drove 5,291km over two and a half weeks and now have 76 sites where geochemical data has been collected which should be able to give us enough coverage to begin understanding the regional geochemical patterns,” Ms Lech said. Five to ten minutes at each site was spent on conducting an in-field FPXRF/Niton analysis. This analysis provided a geochemical estimate for each sample site so preliminary interpretation could begin while more accurate lab results were generated. “The geochemical results will help us determine the optimal sampling techniques needed for the diversity of landscapes found in the region that will hopefully reveal the extent of the Thomson Orogen under cover,” Ms Lech said. During the next two years, LEME will produce regolith map coverage, a geochemical database and an explorers' guide for the Thomson Orogen. KEYNOTE PRESENTATION: AIG-AMEC 2006 Conference. 30 Apr to 6 May, Kalgoorlie WA. Advances in regolith research with respect to locating mineralisation. INVITED PRESENTATION: CRC ASSOCIATION CONFERENCE, 17-19 May 2006, Brisbane, Qld. Mineral Explorers use plants and animals to unveil Australia's desert wealth. Conclusion and products of Progam 1 Project - NT Regolith. Full details in Research section. Keynote Address - Timescales in geomorphology. Dr Brad Pillans, CRC LEME, ANU. ANZ Geomorphology Group Conference, Feb 06, NZ. (Program 2) - the Laterite Geochemical Database of the southwestern Yilgarn Craton, WA. For more informtion and order form. CRC LEME in conjunction with junior mineral explorers Mindax Ltd and Quasar Resources Pty Ltd have entered into a two-year collaborative research project with LEME. This research project will undertake further water sampling in the study area to find the exact location of previously detected uranium anomalies.